Monton with Schuller at UC San Diego, in the Organic Thin Film Fabrication Laboratory. (June 4, 2018) –Carlos Monton, assistant professor in the UTSA Department of Physics and Astronomy, was awarded a three-year National Science Foundation (NSF) award worth $279,976 for an innovative project to fabricate and control one-dimensional (1-D) systems. Over the last 30 years or more, the focus in nanotechnology has been on the study and development of two-dimensional (2-D) materials such as thin films. Monton and his team are going even lower, looking at one-dimensional (1-D) systems, essentially chains of atoms, to understand their physical properties. There are different ways to fabricate these atomic chains. Monton is not only proposing a new way to assemble these chains, but also a way that allows full control of the length, and to make these chains the same length which overcomes the limitations of other known techniques. With this project, he and his team seek to understand the magnetic properties of these ultra-short atomic chains, to see whether the magnetic properties are affected by the length. At this juncture, they can control the size from seven atoms to 400 atoms or more. It is very much a collaborative proposal. The idea came up two years ago with Ivan Schuller, Monton’s collaborator at the University of California, San Diego. Schuller has the technology and the machines that allow the fabrication and Monton knows how to fabricate these chains, having run Schuller’s Organic Thin Film Fabrication Laboratory when he was a postdoc. At UC San Diego, the team fabricates the chains and performs the preliminary magnetic characterizations. 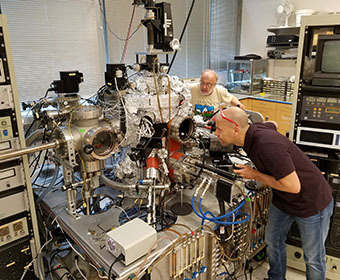 Then at UTSA, they process and analyze the magnetic data and conduct an in-depth structural characterization using X-ray diffraction and electron microscopy on campus. The possibility of fabricating these systems allows the researchers to explore fundamental physics and see what happens with the electronic and magnetic properties of these chains. The results of this project will have a broad effect, allowing for a deeper understanding of the magnetic behavior of low-dimensional systems and may have a direct impact on a new generation of electronic devices. As the frame that supports the very short chains is organic and has interaction with light, the team foresees some applications in which they integrate these chains into other organic materials, which in time, could be used for biomedical applications and sensors. In the same way, they would like to investigate if the magnetism of these atomic chains can be controlled by light. Another theory in which they would like to investigate is whether the spin [an intrinsic electronic property of atoms] can be controlled along the chains. “Since atoms present different spins and we can vary the atomic species along the chains, we hypothesize that we may be able to modulate the spin along the chains,” explained Monton. A year ago, Monton met Duncan Haldane, one of the three Nobel prize winners in 2016. Haldane’s theory on the importance of spin in one-dimension systems has spun many other researchers to prove, or disprove, his argument. Monton told Haldane he might have a way of growing the system to test Haldane’s theory, to which Haldane replied that the idea of modulating the spin using this approach sounded promising. This project will provide a physical system to test Haldane’s conjecture, perhaps also confirm it and find a way to modulate spin along the chain. It may even lead to other properties yet undiscovered. This research is adding to the body of knowledge in this field. Monton and Schuller are also working with researcher Michael Fitzsimmons from Oak Ridge National Laboratory (ORNL). The team plans to use ORNL’s neutron scattering facility to test directly and measure the occurrence of Haldane’s phases on the chains. They already produced preliminary results, which was included in the award proposal to the NSF. They demonstrate they could grow these organic chains, control their length, and modulate their composition. By doing so, they can perhaps control the spin which is what they will be testing. This was a strong point in the proposal. There are also educational and community impacts to this research, which was cited by the NSF. The funding will support two graduate students working on their Ph.D. thesis and at least two undergraduate students per semester working on this research project for the next three years. Monton’s commitment to this proposal is to give priority to underrepresented students. For community impact, the team will establish a partnership with a local San Antonio high school to expose students to research and to consider a STEM career. With Schuller being a five-time regional Emmy winner, the team plans to produce a series of short videos using a comical approach to explain nanotechnology. It will be shared on public platforms to be used for educators to engage middle and high school students. The collaboration with Schuller dates back eight years. When inspiration struck, they started working on it two years ago. Monton has been traveling every 15 days for a year and a half to run the lab at UC San Diego and get preliminary data to apply for the funding. Moving forward, students from both institutions will work together. With UC San Diego classified as a R1 institution, UTSA students will be exposed to a Tier One lab, researchers, new equipment and train in new techniques, receiving high-level training. Looking ahead, Monton and Schuller are also collaborating with Trevor Willey and Alexander Baker at Lawrence Livermore National Lab to seek DOE funding to support additional applications of their research. Along with Fitzsimmons at Oak Ridge, ultimately, they envision the four labs collaborating which will benefit all students involved in this research.